Zinc (Zn) is an essential trace mineral needed for the formation of insulin and numerous enzymes in the chicken's body. It is responsible for the catalytic, structural, and regulatory functions in the body. Even mild deficiencies of Zn has been found to have a huge impact on the growth, development, and immune function in chicks. Recent studies have revealed that an extensive amount of changes occur in the chicken's microbiota composition when they suffer from chronic Zn deficient conditions. These changes can result in an over abundance of certain pathogenic, opportunistic bacteria to invade and cause serious disease outbreaks such as GD and NE caused by the overgrowth of Clostridium bacteria. Chickens with zinc deficiency often show signs of stunted growth, frizzled feathered, and shortening and thickening of the long bones with enlarged hocks. If the deficiency has occurred for less than a 2 week duration, with prompt treatment, signs associated with the deficiency can be reversed; otherwise the chicks will likely remain deformed. Different nutrients can have an affect on a bird's zinc status. 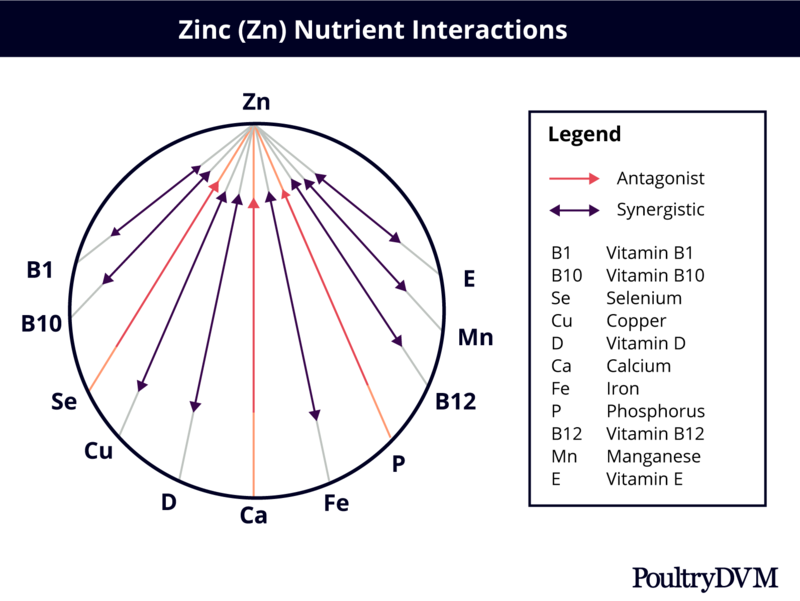 Some vitamins and minerals are antagonistic to zinc while others synergistic--which can have a direct or indirect affect. For example, any additional vitamin D to the diet can result in the increased absorption of calcium, thus suppressing zinc absorption. Gastrointestinal dysfunction or disease may also cause an interference leading to zinc deficiency. Word of Caution: Any suspected zinc deficiencies should be confirmed by your vet before any zinc supplementation is given. Only absolute deficiency conditions may require very small amounts of zinc added to the diet. Over supplementation with zinc can result in Zinc toxicity. Histidine Increasing the level of dietary histidine in the diet may help alleviate leg defects.